Staten Landt is a rather complicated place: changing in size and location on the globe. 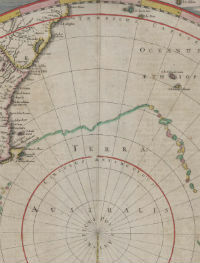 It appears sometimes as a continent near the Americas, and at others as an island attached to Australia or New Zealand. It is a newly depicted land which seems to have both emerged and became extinct in the course of the 17th century.